Sometimes simple really is the best. Most of my favorite recipes are the most simple ones. Like this yummy recipe for sweet & sour sauce. I've had this recipe for over 15 years, when I found it in a magazine. I love how easy and quick it comes together. I also love that it has no additive, preservatives or food coloring. I can whip this up with some fresh stir fried veggies, what ever meat I have on hand, and some sticky rice...dinner is ready in no time. This sauce can also be made ahead of time and kept in the refrigerator for up to two weeks. 1. Combine the vinegar, brown sugar, ketchup and soy sauce in a small sauce pan. Bring to a boil over medium high heat. 2. Mix together the cornstarch and water, add to the other ingredients and stir until it thickens. 3. Remove from heat and serve with stir fried veggies, meat, egg rolls, wontons...just about anything. Where can I find this recipe? Itlooks soooooo good! TFS! Bug Hugs! Sorry I didn't include the whole recipe, but basically it's just some veggies and meat stir fried then I add the sauce at the end. Serve over rice. 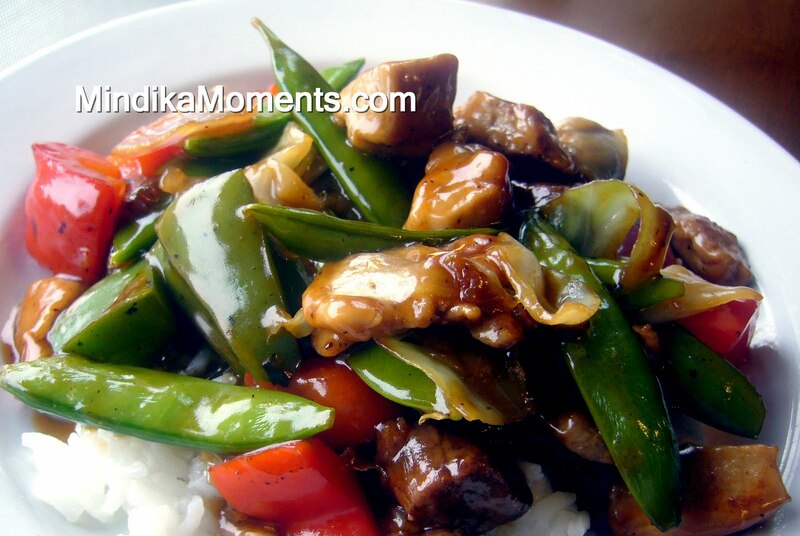 This particular one I used some beef and chicken with red peppers, snow peas, and onions.